A Minnesota woman arrested early Saturday for drunk driving had several “alcohol Jello-shots” stuffed in her pockets when searched by police, according to a court filing. 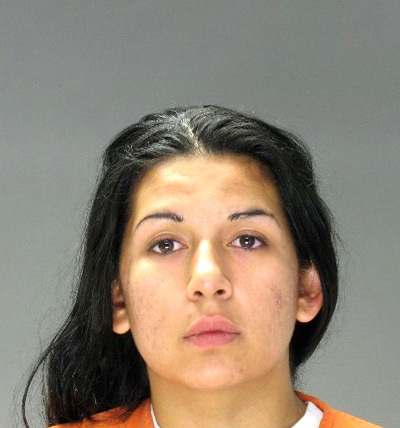 Cathy Sanchez, 28, was driving on Highway 10 around 2 AM when a cop spotted her vehicle speeding and swerving across the road. Upon pulling over Sanchez’s Buick LeSabre, a Glyndon Police Department officer detected signs that she was impaired (slurred speech, bloodshot and watery eyes, and an aroma of booze). Pictured above, Sanchez failed a series of sobriety tests and registered a .136 blood alcohol content during a Breathalyzer test. “In a search incident to her arrest,” an investigator noted in a probable cause statement, an officer “located three alcohol Jello-shots in the female’s pockets.” For her part, Sanchez--who initially gave cops a fake name--told officers that she had previously been busted five times for drunk driving. Sanchez (seen at left) was charged in a four-count criminal complaint that includes a pair of felony charges that each carry a maximum of seven years in prison. She is currently locked up in the Clay County jail, where bond was set at $20,000. The probable cause statement does not indicate whether the Jell-O shots were seized as evidence.